Made of chrome-nickel steel, Forster’s golden boy captivates with its elegance and aesthetics and blends majestically into the room. 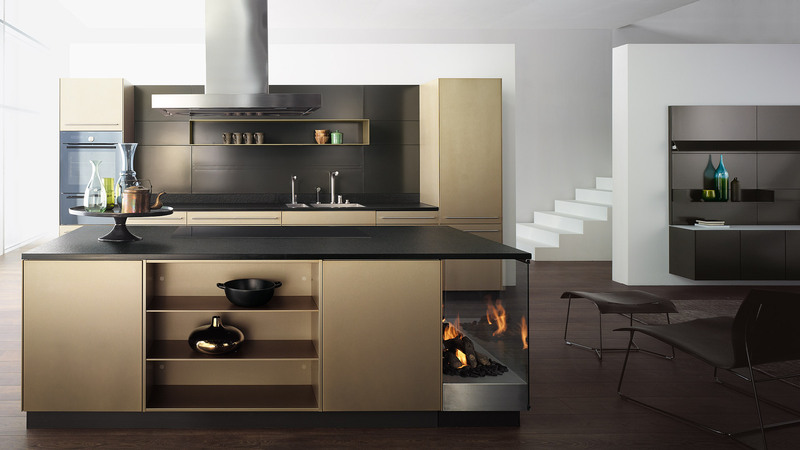 With a built-in bioethanol fireplace, the elegant Forster kitchen stylishly demonstrates how a flowing transition from the kitchen to the living room can be achieved. The iridescent shade of gold gently radiates its pleasant warmth. An elegant ensemble is created in combination with the black magnetic rear wall panels. The light plays subtly on the golden shimmering surface and the structure of the brushed stainless steel. The slender, 8-mm-thick shelves round off the overall picture to perfection. The natural stone work surface lends the kitchen character thanks to its powerful contrast and makes it a striking thing of beauty. The matching living shelf blurs the boundary between living and cooking in a unique way and creates a breathtaking feeling at first sight.